At least five Pakistani soldiers were killed and six others injured in retaliatory firing by Indian Army in the Bhimber and Battal sector of Jammu and Kashmir on Thursday. As per sources, the Indian Army was responding to unprovoked ceasefire violations by the Pakistan Army. Earlier in the day, the Pakistani Army initiated indiscriminate firing of small arms, automatics, 82 mm and 120 mm mortars along the Line of Control (LoC) in Jammu and Kashmir's Nowshera and Krishna Ghati sectors, to which the Indian Army posts retaliated strongly. 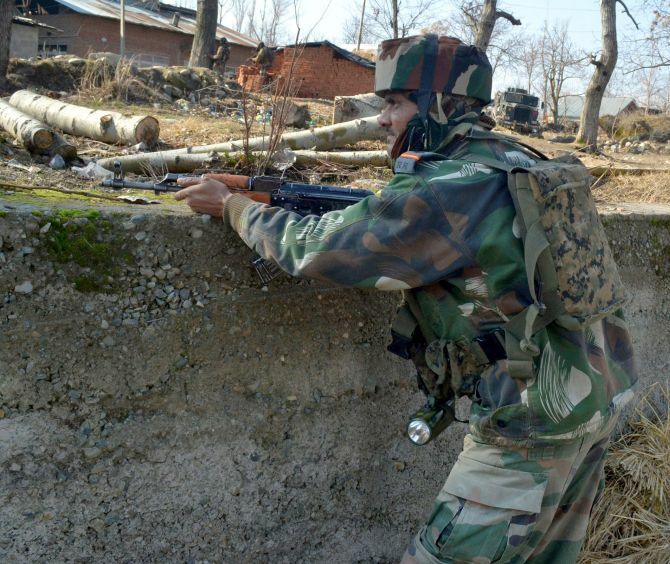 A General Engineering Reserve Force labourer was killed while two others including a Border Security Force jawan were injured in the shelling and firing on forward posts along the LoC in Rajouri and Poonch districts. “One civil GREF labourer was martyred, and one GREF driver injured in ceasefire violations by Pakistani troops. One Head Constable of BSF received splinter injury in Krishnagati sector. He is out of danger,” Defence spokesman Lt Col Manish Mehta said. “Pakistan Army resorted to mortar shelling and firing on forward posts along the LoC in Nowshera sector in Rajouri district from 0730 hours (7.30 am),” he said. Pakistani troops also opened fire and shelled posts along the LoC in Krishnagati sector of Poonch district at 07.40 am, he said. The reports said there had been firing along the LoC in Balnoi and Mankote sectors too. “The Indian Army posts are retaliating strongly and effectively and the firing is presently on,” he said. The firing and shelling by the Pakistan army in May this year has affected over 12,000 people. Army Chief General Bipin Rawat on Thursday held a meeting in Jammu and Kashmir and discussed issues of logistics improvement, mobilisation and security review along the LoC. Pakistan summoned India's deputy high commissioner in Islamabad and 'condemned the unprovoked' ceasefire violation by India along the Line of Control that killed two civilians and injured five others. Foreign Office said in a statement that India resorted to firing in Battal, Jandrot and Kotli sectors. "The Director General (South Asia & SAARC), Dr. MohammadFaisal, summoned the Indian Deputy High Commissioner, J PSingh and condemned the unprovoked ceasefire violations by the Indian occupation forces on June 1," it said. One person was killed and four others injured in Battalsector, while one person was killed and another injured in Kotli sector. The Foreign Office said the 'deliberate targeting' ofcivilians is contrary to human dignity and international human rights and humanitarian laws. "The Director General urged the Indian side to respectthe 2003 ceasefire understanding; investigate this and otherincidents of ceasefire violations; instruct the Indian forcesto respect the ceasefire, in letter and spirit and maintainpeace on the LoC," it said. Pakistan is planning more LoC attacks!